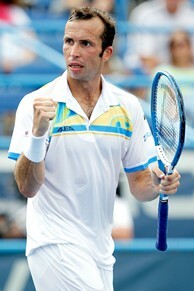 Radek Stepanek of the Czech Republic pumps his fist, advancing to the Legg Mason Tennis Classic semifinals. WASHINGTON (AP) - Radek Stepanek of the Czech Republic beat No. 5-seeded Fernando Verdasco of Spain 6-4, 6-4 on Friday to reach the semifinals at the Legg Mason Tennis Classic. Stepanek, at 32 the oldest quarterfinalist, had lost three matches in a row to Verdasco. But this time, Stepanek saved seven of the eight break points he faced. He also volleyed well, winning the point on 21 of his 29 trips to the net. The 54th-ranked Stepanek will try to reach his first final of the season when he faces No. 7-seeded Marcos Baghdatis or Donald Young on Saturday. Also in quarterfinal action later Friday: top-seeded Gael Monfils vs. No. 6 Janko Tipsarevic, and No. 3 Viktor Troicki vs. No. 11 John Isner.